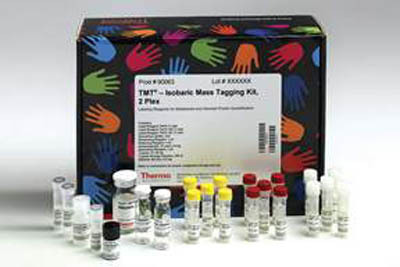 Isobaric chemical tags are powerful tools that enable concurrent identification and quantitation of proteins in different samples using tandem mass spectrometry. They are small chemical molecules with identical structure that covalently attach to the free amino termini of lysine residues of peptides and proteins, thereby labeling various peptides in a given sample. During the MS/MS analysis, each isobaric tag produces a unique reporter ion signature that makes quantitation possible. In a typical MS analysis, the labeled peptides are indistinguishable from each other; however, in the tandem MS mode during which peptides are isolated and fragmented, each tag generates a unique reporter ion. Protein quantitation is then accomplished by comparing the intensities of the six reporter ions in the MS/MS spectra.